The Rough Scientists make a map, paper and ink, and a sound-recording device. 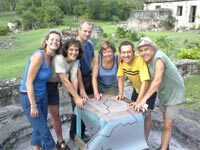 Kate Humble and the team of five scientists take up the challenge of charting the sights and sounds of their tropical island. Starting from scratch, they must make an accurate scale map, botanical paper and inks, and a sound-recording device. While a very good head for math and plenty of versatile local plants get them started, impassable mangrove swamps and tropical downpours soon seem intent on scuttling their plans.